This is the last post from the series on how we could implement a design that allows to decide only at deploy time how two services communicate: in process if they are deployed on the same server or inter-process if they are on different machines. The first post shows where such a design is useful and what are the benefits it brings. The second one, takes an example from the financial systems world, and outlines the key design ideas on how to implement it. In this post we'll only focus on code. 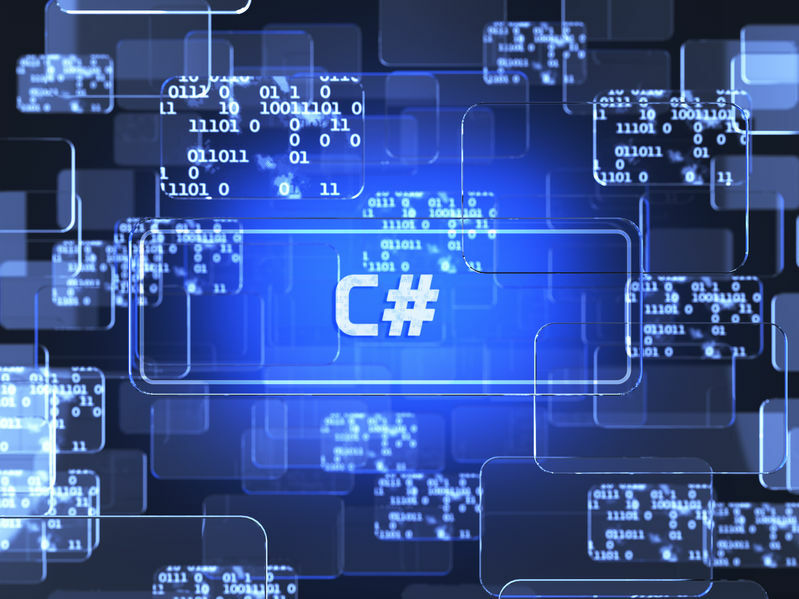 We'll take the example presented in the previous post and code it from scratch in C#. The entire source code that we are going to walk through is available on Github, here, as part of my Code Design training. Each implementation step is marked with a tag in the git repo. We have ipc-step0 for the starting point and so on, until ipc-step10b. You can see how the implementation evolves step by step. 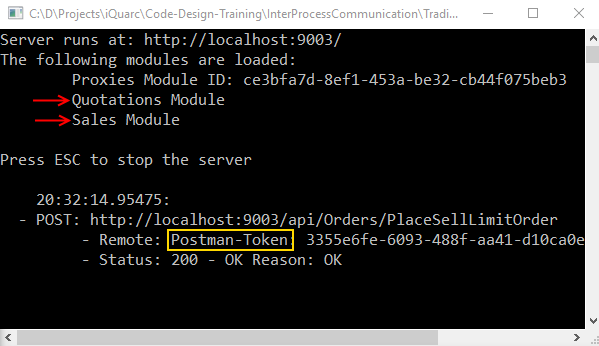 If we checkout the final step (ipc-step10b), we have what we wanted in the previous post: the ability to change the communication between the OrdersService and QuotationService to be in-process without changing code or recompile. this gets from the QuotationService the quotations for the NYSE in a time window. You can notice that each console writes the calls it received and the remote that made it, so we can see what happens in our demo app. and further more, we can see another REST call made by the OrdersService to the QuotationService. We see it logged in the console of the process that loaded the Quotation Module (the one at the bottom below). 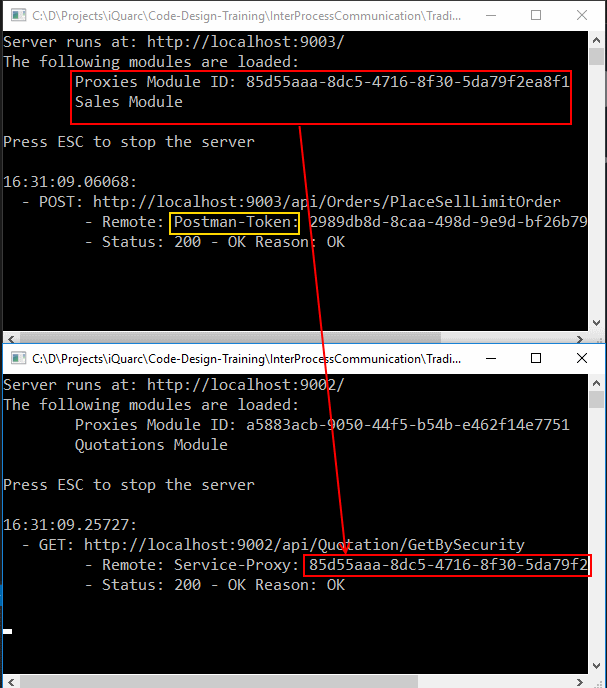 We see that the remote is a Service-Proxy with the GUID of the proxies loaded by the process that hosts the Sales Module, as outlined with red below. This means that the one that made the call to the Quotation Module host was the Sales Module host. So we had an inter-process communication, the SalesService making a REST call to the QuotationService, when someone else made a call to it. Now, lets change the communication. We first close the process with the Sales Module. Then we copy in its output folder (bin\Sales\) the QuotationServices.dll. This is the binary that has the implementation of the QuotationService. 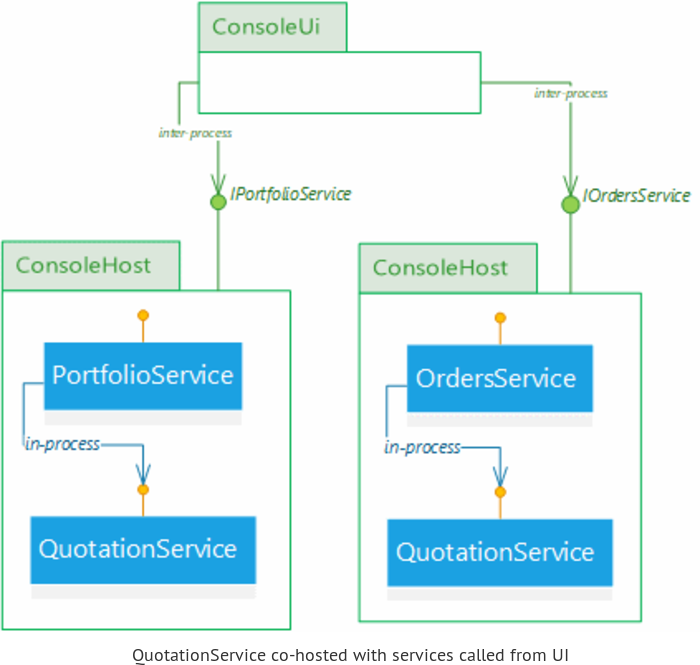 Mainly we've changed the deployment configuration, by having now in the same output folder the binaries with implementations of the SalesService and of the QuotationService. Now, we just restart the host by executing the bin\Sales\ConsoleHost.exe. We see that it loaded both Quotation Module and Sales Module. The other two console hosts remain running. we see that no other inter-process call is made. Noting gets logged in the other consoles. The SalesService did call the QuotationService since it depends on it, but the call was just a function call in the process that hosts them both. So, only by the fact that we've changed the deployment by copying the QuotationsService.dll into the same \bin folder with the SalesService.dll and then restart the host process to load them both, we have switched from a inter-process communication to an in process communication. where OrdersService and QuotationService are hosted by the same process and an external call to the OrdersService can by satisfied with an in process communication with the QuotationService. If we checkout the ipc-step0 we have the solution structure to start with. At this step all the projects are empty. We have a console project (ConsoleHost), which will be our generic host. 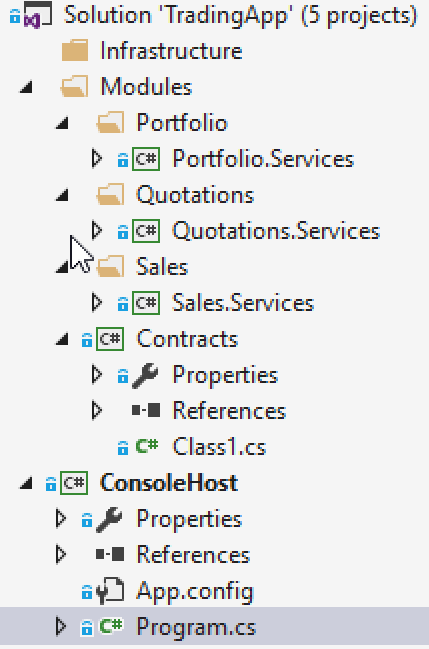 Then we have class library projects where we'll implement the services, and another one for the contracts. The solution structure is a key element of our design and I have detailed in the previous post here, the basic rules we want to enforce with it. As pointed in the previous post here it is a critical requirement for this design that the dependencies among the services are towards interfaces. So, the OrdersService class depends on the IQuotationService interface and not on the QuotationService class. The same is for the PortfolioService. At this point we have service contracts and implementations for them but they are not linked in any way. If we look at the Project Dependencies Diagram we see that we have no references nor strong dependencies among them. In the previous post here, we've detailed why this is important. The iQuarc.AppBoot will bring things together. We'll use it for type discovery to find the service implementations deployed, and then to satisfy the dependencies by configuring the underlying DI Container. So, the next step is to install and configure it. We can install it as a NuGet Package to all the projects under the \Modules folder. The iQuarc.AppBoot package doesn't have dependencies to any DI Container, and it is not a container by itself. It uses a container by an abstraction. It is good to also keep our modules (the place where we implement the business logic of our system) independent of a specific DI framework. However, the host project needs to use a specific container, so for it only, we will install the iQuarc.AppBoot.Unity, which adapts the Unity Dependency Injection Container to AppBoot. The ConsoleHost is our generic server process. It should find all the services deployed, then publish them to be called from other processes and configure the dependencies. In a real system this would be an web app in IIS or a Cloud Service, or a Windows Service etc. For this demo it is a simple console app. To use AppBoot to find the deployed services, first we need to decorate all the service implementations with the ServiceAttribute. With this we declare that the QuotationService class is the implementation of the IQuotationService interface. 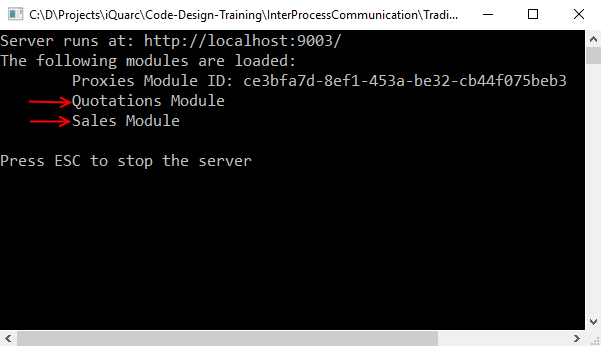 The same goes for the other service we have implemented in the \Modules folder. So at the root level, we'll have a \bin folder where all the projects get build. For our demo purpose this is not that important. 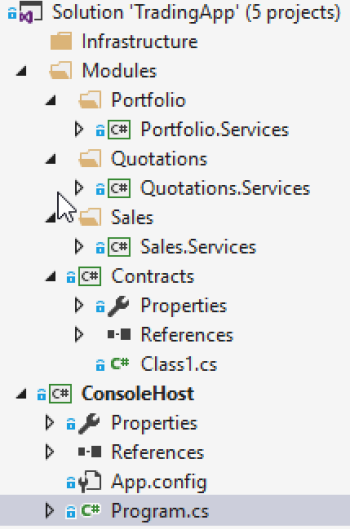 We just need to make the services available for REST calls, so a simple self host in the console app of the Web Api will do. They get through constructor DI the service they should make available through REST and they just forward the calls to it. To make our ConsoleHost truly generic we should make a generic ApiController which gets the service through DI and forwards the call to it, and then we should customize the WebApi to use through some conventions our generic controller. Definitely it could be done, but it doesn't worth for our demo, so we just create three dummy controllers for each of our services. Now if we checkout ipc-step7b we have all of the above implemented. If we execute the ConsoleHost.exe we see that it loaded all the three modules, because they were all copied in this \bin folder. If we make the same POST call from Postman to the OrdersService it works and it will do an in process communication with the QuotationService. Everything is hosted in one process, like a fat server, which does not scale. If we delete the Quotations.Services.dll and run again the ConsoleHost.exe we see that it only loaded the two remaining modules: Portfolio and Sales. 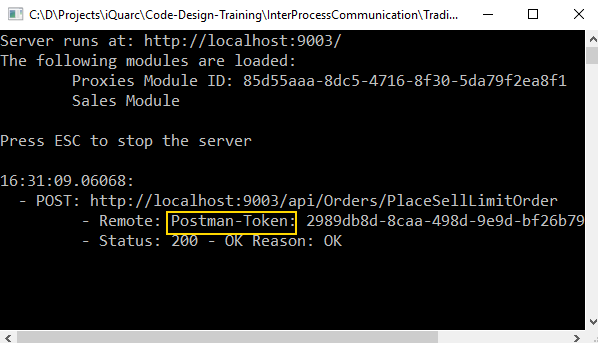 Now if we make the same POST call from Postman it returns a 500 Internal Server Error because the OrdersService did not find an implementation for its dependency to the IQuotationService. What we wanted above, is that when a dependency is not found in the same process to make a REST call to another process where that dependency is hosted. To make this happen, we need to create other implementations to the interfaces describing our contracts, which know how to forward the call over REST. These are the Proxies. The proxies are part of the infrastructure. They are just plumbing code, no business logic, and we want them deployed on all our ConsoleHost instances to be the fail over when a real service implementation was not deployed. Therefore, we put them in the \Infrastructure folder. They use a HttpClient, they build the URL to the service they want to call, based on some conventions, and they make the REST call. The response is then returned to the caller. We can checkout icp-step8b to have the proxies for all our services. Now, we have two implementations for each of our contracts: the proxy and the real service implementation. The proxies are not yet used by the AppBoot. If we were to also decorate them with the ServiceAttribute as we did for the service implementations, the AppBoot will register both implementations for one interface and the last one found will overwrite the first. This is not deterministic, so it is not good. When a service is not deployed, as we've seen above, sometimes things will work, sometimes not, depending on which type was found last by the AppBoot while it scanned the deployed assemblies. To fix this, we need to extend the conventions AppBoot uses. The ServiceAttribute we've used so far, was just a convention that says to register to DI interface - implementation pairs decorated with this attribute. We can create a new attribute say ServiceProxyAttribute and register a new convention to AppBoot. The convention is implemented as a IRegistrationBehavior, where we just return what should be registered to DI from a type that was found during the assemblies scanning. Checkout ipc-step9a to get these implemented and have all the proxies decorated with the ServiceProxyAttribute. The order we add the registration behaviors to the bootstrapper matters. The latter overwrites the registrations returned by the previous. So we add first the ServiceProxyRegistrationBehavior which puts into the DI Container proxies as implementations for all the contracts. If we'd leave it like this, all the service calls will be REST calls to other processes through the proxies. The ServiceRegistrationBehavior is the second, so it overwrites the proxies registrations with the real implementation for the services that were deployed. This means, that if the real implementation of a service was deployed, thus found at the assemblies scan, it will overwrite the proxy implementation, therefore the call to that service will be direct to real implementation in the current process. If it is not found, the proxy registration is not overwritten and the call will be done in another process.